The Internet touches almost all aspects of everyone’s daily life, whether we realize it or not. 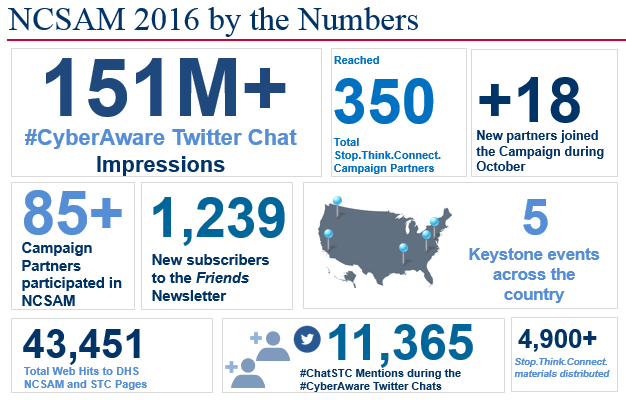 National Cyber Security Awareness Month (NCSAM) is designed to engage and educate public and private sector partners through events and initiatives to raise awareness about the importance of cyber security, provide them with tools and resources needed to stay safe online, and increase the resiliency of the Nation in the event of a cyber incident. For more information or visit Homeland Secuirty's website and check out thier Stop.Think.Connect. Toolkit. It provides resources to help you stay safe online. Link is below. Find all the cyber materials in the Stop.Think.Connect. Toolkit here. Newer PostHello, it's me, Winter; Are you ready for my arrival? Older PostDon't SLIP or TRIP while FALL turns to winter.